Ive just installed the Ruins of Atlantis Virtual World in RobotC 4.30. I want to use the sample code provided, however, RobotC does not recognize "mammalbot" as a robot. I do not see an RVW Mammalbot in the Motor and Sensors section either. Is there someway to install the fantasy robots, or do the fantasy robots correspond with other already installed RVW robots (squarebot, clawbot, etc)? The sample programs for Ruins of Atlantis were created using the Anemobot. They use the standard Model "RVW Anemobot." If you wish to program using a different robot you will have to change the standard model in ROBOTC. The Standard Models name for the mammalbot is "RVW Mammalbot." 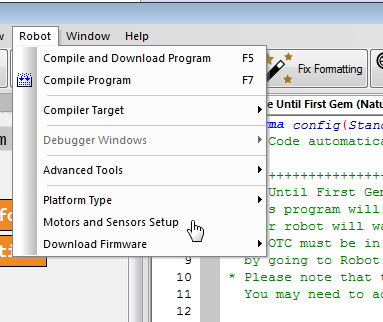 You can find all of the standard models by navigating to your Motors and Sensors Setup window in ROBOTC. Once there click the "Standard Models" drop down menu. Once here you can select the robot you want to use and click apply. This will automatically configure your motors and sensors to work with the robots inside the virtual world. If this does not answer your question please let me know. 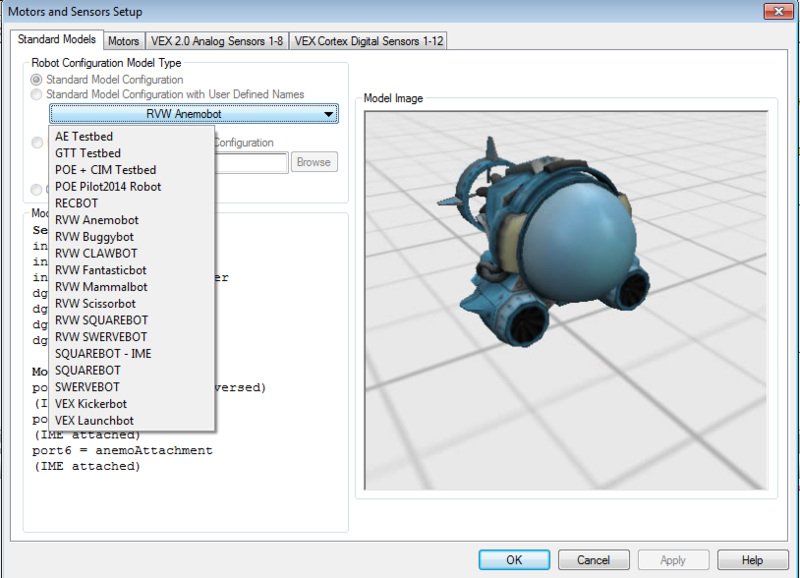 The three "Fantasy" robot configurations are automatically downloaded with ROBOTC 4.30. If they are not there, please send me a screen shot of all of the standard models that do exist in ROBOTC. (similar to the picture above).